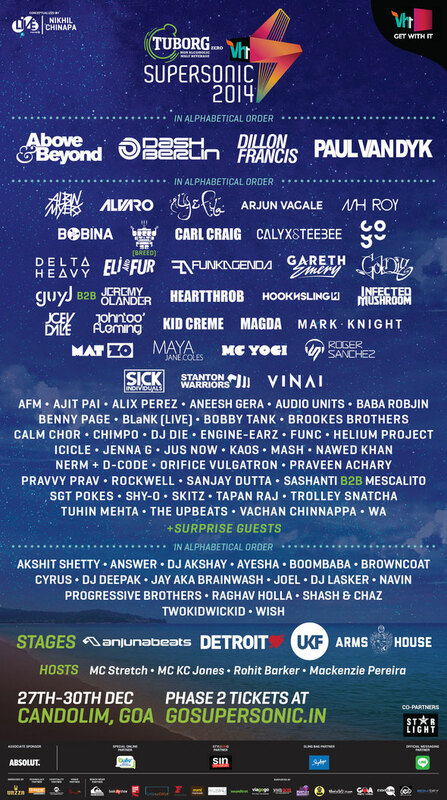 The full line-up for this year’s Vh1 Supersonic Festival in Goa was recently announced. The second edition of the festival will take place between 27-30 December, where 60,000 revellers from around the world will descend on the beaches of Candolim in western India to enjoy five stages hosted by some of electronic music’s biggest artists. In addition to the already announced headliners Paul van Dyk, Dillon Francis, Above & Beyond and Dash Berlin, organisers recently announced that festival goers will be treated to a special guest set by The Chainsmokers. More names from across the spectrum of dance music include the previously confirmed Stanton Warriors, Mat Zo, Maya Jane Coles, Mark Knight and Funkagenda, and the likes of Carl Craig, Goldie, Infected Mushroom, Gareth Emery, Magda, Delta Heavy, Roger Sanchez, Calyx & Teebee, Heartthrob, Alex Perez, Trolley Snatcha, Sick Individuals, Coyu, Alvaro, Albin Myers and Aly & Fila, all of which have just been added to the line-up. The event will also feature the first ever back2back set from Guy J and Jeremy Olander, as well as a selection of local talent from India. With stages hosted by Anjunabeats, DETROIT, UKF and Arms House and with hosts MC Stretch, MC KC Jones, Rohit Barker and Mackenzie Pereira on crowd control duty, Vh1 Supersonic has possibly put together one of the most diverse collections of artists at an Indian event. Tickets are available now at www.gosupersonic.in.